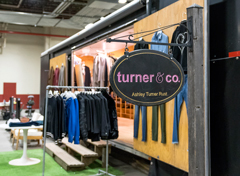 As kick-off to the iconic annual Indoor Circuit, it's no surprise that the Pennsylvania National Horse Show also plays host to some of the best horse show shopping. While such classes as the $132,000 Grand Prix de Penn National and the USEF National Hunter Seat Medal Final highlight the action in the show ring of the Farm Show Complex, the boutiques that ring the arena on two levels are much of the fun and tradition of the Pennsylvania National Horse Show. Exhibitors and spectators alike make it a point to enjoy the unique shopping environment. From high-end shops reminiscent of Fifth Avenue and Rodeo Drive to t-shirt and tack vendors, more than 60 specialty stores offer hours of shopping for one-of-a-kind equine related products, fine arts, gifts, accessories and much more.